About "Girl Power (Faithgirlz! Series)"
Written by bestselling author Melody Carlson. Meet Morgan, Amy, Carlie, and Emily. They all live in the trailer park at 622 Harbor View in tiny Boscoe Bay, Oregon. Proximity made them friends, but a desire to make the world a better place?and a willingness to work at it?keeps them together. 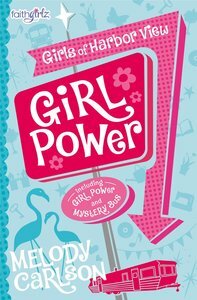 In the first book of this series, Project: Girl Power,bullies knock Emily from her bike on her way home from school, so the girls start walking together because there's safety in numbers. With help from other people in the park, they set out to beautify Harbor View. In book two, Project: Mystery Bus, the girls begin summer by working to clean and restore their bus to use as a clubhouse. And thus begins the Rainbow Club. Make every moment with God count with the Faithgirlz 5-Minute Devotions for Girls for readers ages 8-12. Written for girls on the go, this 5-minute devotional will help busy girls slow down and take time to grow closer to God. Short and sweet devotions applicable to everyday life are paired with relevant Scripture passages that will resonate with readers. Devotions focus on the ups and downs of tween-hood-friendships, peer pressure, bullying, boys, and self-confidence-all while showing girls how to live their faith each day. With a beautifully foiled cover and a 2-color interior, this devotional makes the perfect gift for holidays, birthdays, and everyday giving. Features text from the bestselling New International Version (NIV) translation.